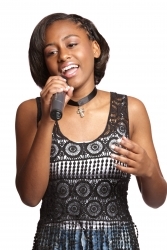 Nashville, TN, December 08, 2018 --(PR.com)-- 14 year old Florida native, Christian/Pop Singer, Songwriter, Musician, Jordan Denise Williams, released her new single "I Close My Eyes," from her upcoming album “I’m Gonna Fly,” with a stunning live performance at the Krazy Kup in Plant City, FL. Live Performance: https://youtu.be/F_Exzqqihe0. She is the currently The Best Of The Bay Winner for Best Original Pop Act and Best Of The Bay Reader’s Poll Runner Up for Best Dancer and Best Release by a band for “I Close My Eyes. A portion of the net proceeds are benefiting the American Cancer Societies’ Making Strides Against Breast Cancer for the remaining of 2018. Jordan has supported the ACS, by lending her voice for the past 3 years starting the commencement ceremonies with the National Anthem, fundraising, volunteering, walking for the cause, and sharing her new releases to help inspire the crowd. “My mom is a cancer survivor and I have been affected by many people with cancer both young and old. I want to share what God has blessed me with to help people and to make a difference. I believe a song can heal someone,” says Jordan. "I Close My Eyes" is currently on the ballot for consideration for a nomination for the 61st Grammy® Awards for Best Gospel Performance Song. "If I do not win the nomination I feel as though I have still won by having so many people hear my song. If one person is healed or helped i believe I have won," says Jordan. The single is available for 0.69 cents instead of the typical 0.99 cents on iTunes, Amazon, all major online stores worldwide, and her website: www.jordandenisewilliams.com. 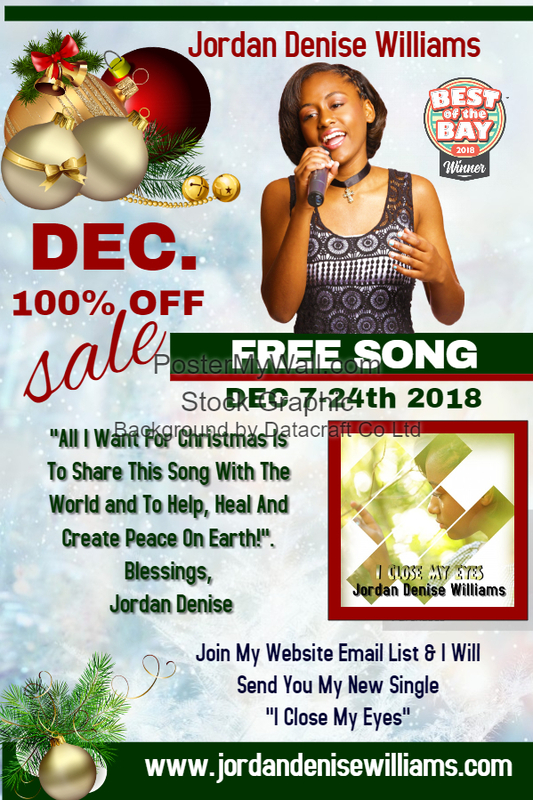 Derlie Records, Best of The Bay Winner for Best Local Label, will be giving free downloads from Dec 7-24th 2018 for "I Close My Eyes" by visiting Jordan's website and joining her email list. "I Close My Eyes," is a beautiful ballad crossing multiple genres and will touch souls with its awe-inspiring lyrics imagining love worldwide--with no color, pain, or suffering---we can see when we close our eyes...and dream by day! Jordan uses her maturing melodic vocals to paint this beautiful picture of hope through the amazing lyrics and music written by and featuring her Dad, Gospel/Jazz Recording Artist and Host of The Christian Television Network’s The Gospel Voice, Derrick Williams, on the piano. Derrick is also known nationwide for his role as "The Rabbi" in the musical "The Rock and The Rabbi." The Gospel Voice is a weekly music show which airs nationally 12:30 AM (EST), 11:30 PM (CST) and 9:30 PM (PST) on The Christian Television Network. Jordan sings as a vocalist in The Gospel Voice Band alongside seasoned veteran vocalists far beyond her years helping to cultivate and shape her maturing sound on The Gospel Voice every week. Jordan has studied piano for 10 years and currently studies under GRAMMY® Award winner, Latin GRAMMY® nominee, pianist, arranger, and producer, Lannie Battistini. In addition to music, she has performed in musical theatre and has studied dance (Tap, Jazz, Ballet, Lyrical, Hip Hop, and Acrobatics) since the age of three. She is a current member of the BSDA competitive Dance Team and a member of her High School Musical Theatre Program and Chorus. She is currently performing on a regional Fall / Winter tour to support her CD sales. Check her website for dates and times. 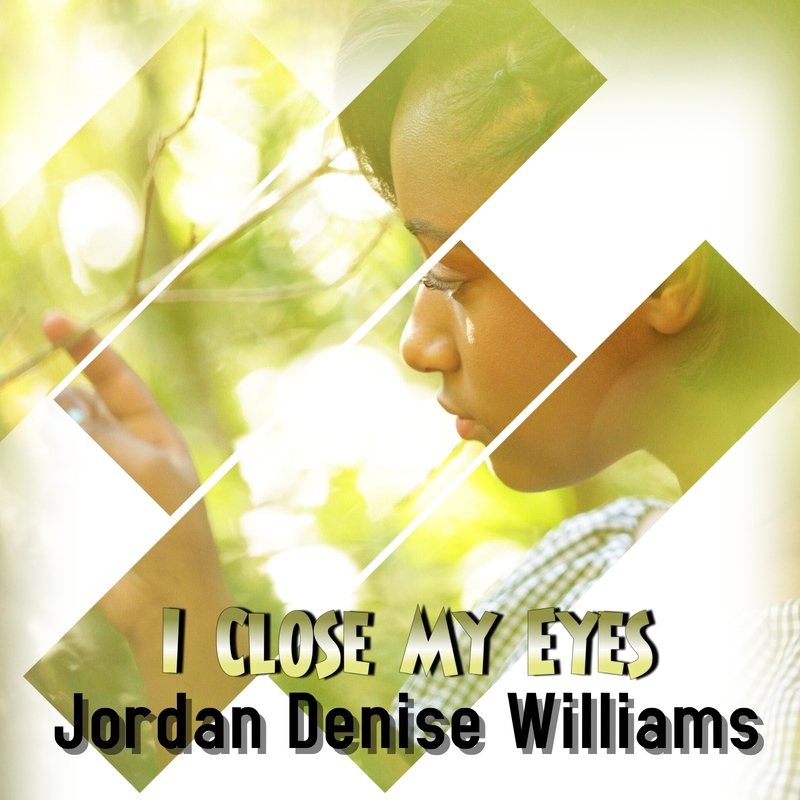 Join Jordan Denise Williams website mailing list at www.jordandenisewilliams.com and receive a Free Download of "I Close My Eyes"
Click here to view the list of recent Press Releases from Derlie Records Inc.